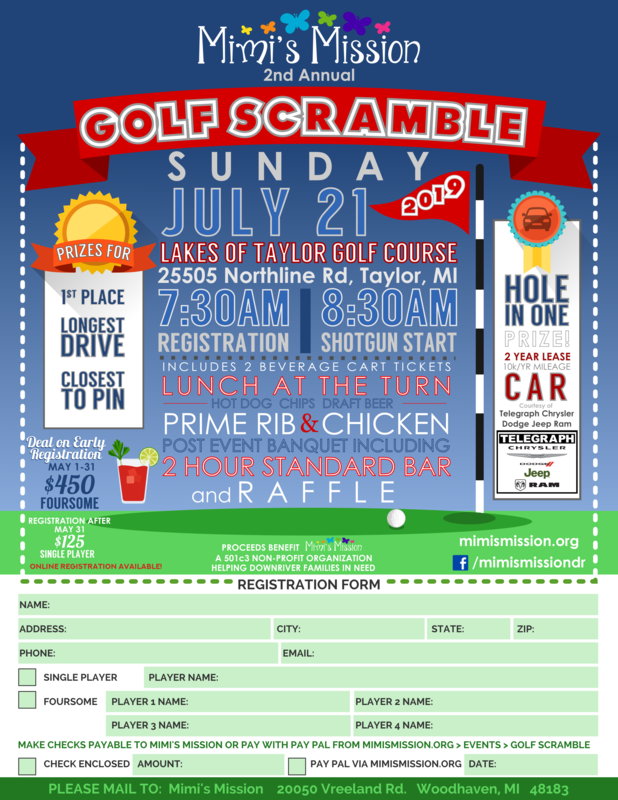 Our 2nd Annual Golf Scramble will be held at The Lakes of Taylor Golf Course on Sunday, July 21, 2019. Registration begins at 7:30am with a shotgun start at 8:30 am. Premium continental breakfast will be served prior to the 8:30am shotgun start. Lunch at the turn (hot dogs, chips, pop and draft beer) and 2 beverage cart tickets are included. Join us for a post play banquet of prime rib and chicken with potatoes or rice, vegetables and a 2 hour standard bar. Prizes will be awarded for 1st place, longest drive and closest to pin. The hole in one prize is a 2 year vehicle lease from Telegraph Chrysler Dodge Jeep Ram! We will also hold a raffle during the banquet. Early registration for the event is May 1-31, $450 per foursome. After May 31, registration is $125 per single player.